Designed for the Beginner Pilot. Big Ear and B-stall Facilities. 3 Riser system with accelerator. 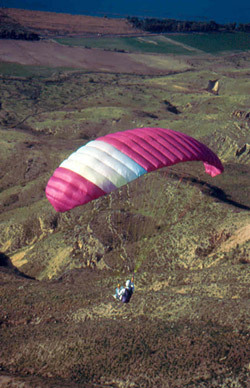 Prima II - In 1998 we launched a modified version of the Prima. The modifications are similar to those we used when converting the Sabra to Sabra II. Standard risers were replaced by split “A” risers, this improved the launch characteristeics and made Big-ears more accessable to the novice pilot. The front part of the rib is now manufactured from 80 gr/m2 Trilam, instead of regular cloth, further improving launch characteristics and the leading edge airfoil. We also changed the color design to be in line with current trends. We have successfully certified the Prima II 30 in AFNOR Standard Class, so now all 3 main sizes - 24, 27 and 30 are certified in Standard Class. Prima II is available in 5 sizes covering the entire range of pilot weights and is still very popular with schools, pilots and paramotor enthusiasts. We will continue manufacturing Prima II in years to come. Prima II is in regular production and is available for immediate delivery. 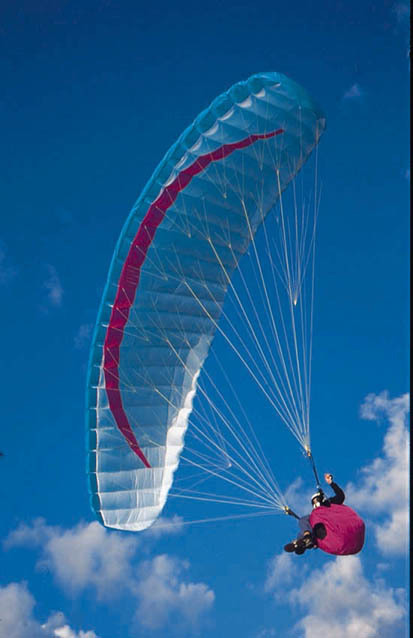 Paramotor Version:- A version for paramotor use is available, featuring specially adapted shorter risers with trimmers.